Kitchen Snaps: Simple Healthy Banana Bread, No Butter, No Oil, No Granulated White Sugar! 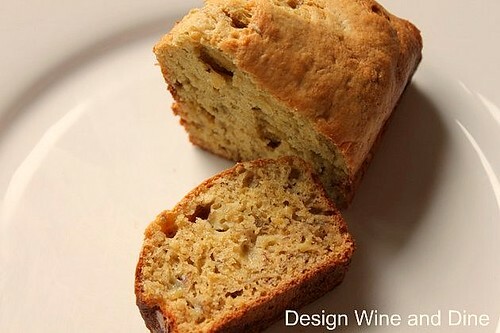 Simple Healthy Banana Bread, No Butter, No Oil, No Granulated White Sugar! By now it's pretty obvious, I don't bake much. I'm sure for the same two reasons many non-bakers would admit...I'm simply not into precise measuring and more importantly, if a plate of hot, chewy brownies resides in my home, I shamefully find them impossible to resist! But when your 3 year old little girl, with hypnotic hazel eyes (only slightly obscured by bouncy auburn curls) points out the large black bananas sitting idle in a bowl (you swore before bed last night wouldn't go to waste) and says, "Mommy, we should use those to make banana bread, they're severely decaying." Wait? Severely decaying? Here's where I insert subtle underlying parental boast (with hand clenched over heart), "I don't know where on earth she gets it?" Except that's not what this is about...and quite honestly, don't most parents owe early vocabulary and scientific acumen to Nick Jr. and PBS Kids? There I was knee deep into quinoa stuffed dolmas simmering atop the stove (or rather falling apart in a sea of olive oil and stock), when I gleefully abandoned one project for another. I mean what is a mom to do? I needed a super healthy banana bread that was simple to prepare. I cleaned up mess #1, washed our hands, gathered all necessary ingredients, secured her apron, and an hour later, Voila, banana bread! No butter...no oil...no granulated white sugar. The end result was a bread that tasted healthy, moist and delicious...the vanilla and lemon zest evident in each and every bite, without masking the succulent combination of crystallized brown sugar and overly ripe bananas. The aroma emerging from the kitchen lured the husband from his office and the baby from his nap (make that three reason I don't bake). Cold milk and slightly warm bread...it was a treat to enjoy a rare homemade baked good with my family - in the middle of the afternoon. Mix dry and wet ingredients until just well incorporated. Pour into a generously greased and dusted loaf pan (I used 3 small loaf pans and filled 3/4 up). Bake at 350 for about 50 min (for one large loaf) - my 3 loaves took 25 minutes on convection bake - a toothpick inserted in center should come out clean. Wait 10 minutes before removing from pan and placing on a rack to cool. I usually have over ripe bananas that I have in my freezer, so banana bread is a great default dessert! Thanks for posting this healthy alternative! My son started talking when he was 2 years old. We were so scared back then, but when he talked, let me tell you, we didn't know where on earth knew all these difficult, grown up words. Even today he never ceases to amaze me with his vocabulary. You see your daughter made you a baker already. The only thing you need is a good incentive and you found it. Your daughter sounds like an absolute joy! And a genius...I don't know many three year olds who request to bake banana bread. Good call on her part. This looks fantastic! This is a great recipe. So simple! i find it so much fun to read! I came upon this recipe because I was out of canola oil. While as you state it does not contain certain ingredients, it is NOT healthy. It contains white flour. Milk and eggs are both ingredients with high amounts of both saturated fat and cholesterol. Although brown sugar is not bleached, it still metabolizes in the body the same as white and is most likely made from GMO sugar cane. Might I suggest a banana bread recipe by Dr. Andrew Weil if you want to avoid white sugar etc. AND get in good ingredients, like honey and whole wheat flour. Hello, I'd like to try this recipe this weekend. By the way, what do you mean by 3 lg bananas?